Smart Business for Your Business. Suspension filing for documents up to 36" x 48"
Utilizes an advanced indexing system and quality construction to make large document filing easier. Features such as unique design which holds the lid safely open, and a heavy duty, zero tolerance door slide which allows the unit to operate with ease and stability. First, open the lid and use the quick reference indexing system to locate the appropriate document. Lightly glide open the front of the cabinet until it stops in the reference position. In this position the pins remain overlapped to ensure that no document can fall off. After you have found and centered the document you are looking for, open the cabinet into its filing position and slide the document off the pins and out either side of the cabinet. 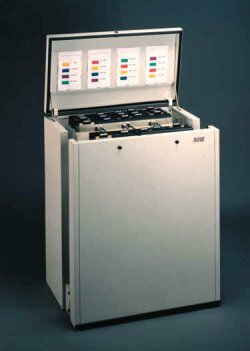 Buttons on the face of the cabinet provide temporary storage for a document while the cabinet is being opened or closed. The Pinfile's two different pin configurations (parallel and pin-and-post) are each available in three sizes. The Pinfile effectively combines advanced design and sturdy construction to create a filing system that is ahead of its time. Available in one of six fine grade powder coated finishes. All suspension tape is made of 100% mylar with a permanent self-adhesive strip. M164P $ 82 164 ft. roll for pin and post set (White Tape). 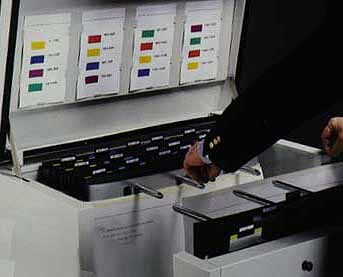 Divider strips help to organize and index drawings by dividing a file into sections. * PinFiles ship via freight services. please select the freight option for this service in the shopping cart. at bottom of shopping cart in place of payment information. Copyright 1996 - 2019, This site is property of and copyright of Biz2Biz Online.